Long before Tesla, Porsche once tried to abolish its dealerships and cut franchises out of the equation. Porsche was going to sell its cars to Americans direct, at least it was before the billion-dollar lawsuit. Going into the 1980s, Porsche was in dire shape. The company had an old-fashioned, gas-guzzling reputation, and it made a scant $4.5 million dollars for the whole of the 1981 fiscal year. But Porsche quickly turned things around. Porsche hired a new CEO, Peter W. Schutz, a German-born American who had never driven a Porsche before, but promoted high tech and almost instantly boosted morale. Profits and sales both nearly doubled by 1982. 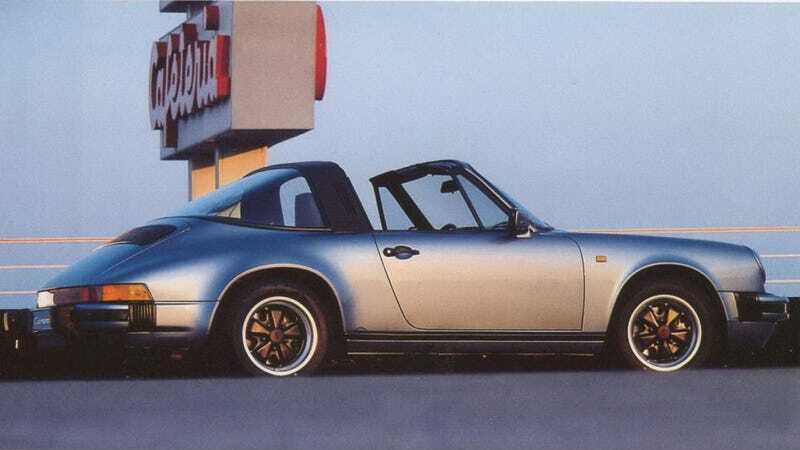 The yuppie ‘80s quickly got good for Porsche. It went public, it poured millions into its R&D center at Weissach, it designed a cockpit for Airbus, redesigned a new car for Lada and even embarked on what was arguably its most ambitious (and arguably tragic) project in its history, constructing the world-beating, twin-turbo, computer-controlled 959. At the same time, Porsche was facing two strange problems with its American operations, where it was making a big chunk of its profits. The first issue was that its contract with Volkswagen of America was coming to an end in ‘84. Porsches had been distributed in America by VW since 1969 and sold in combined Porsche-Audi dealers. Porsche had to make the choice of whether or not to renew that contract. Porsche chose not to. That decision stemmed from its second problem: Porsche felt its dealers were putting too much of a premium on their cars. Then-legal grey-market imports were undercutting Porsche’s own prices, eager dealers were adding their own mark-ups, and Porsche figured this was its chance to re-think how its cars were sold in America. And it did. Porsche axed its traditional dealer system entirely. Or at least, it tried to. “Porsche dealers reacted with hostility and a flurry of lawsuits when Porsche A.G., the West German maker of expensive sports cars, announced plans last month to abolish its franchise dealer system in the United States,” the New York Times reported in early 1984. Porsche’s plan was to allow existing Porsche dealers to become sales agents for Porsche, who could write orders for an 8 percent commission. What they wouldn’t be able to do is buy cars from Porsche then sell them to individual customers, which is how dealerships normally work. Porsche also planned on building 40 of its own centers across the U.S., where it would sell and service its own cars. This is much like what Tesla has today. And much like what Tesla has had to deal with, Porsche’s dealers revolted. “In opposing the company plan, the Porsche dealers’ main legal weapons were the franchise laws in various states, which make it difficult for manufacturers to simply terminate franchisees without good reason. Leaders of the dealer group said they were not sure how many suits had been filed,” the NYT reported at the time. By 1987, Schutz was out at Porsche. Currency fluctuation with the Deutschmark meant that Porsche was losing out on its profit margins, yuppies were less buoyed with cash, and Schutz’s most ambitious programs were stumbling. It’s all a real shame. General Motors was considering cutting out franchised dealers for Saturn, but pulled out on that plan when the company saw how poorly it went for Porsche. Only Tesla has managed to sort of get away with it today, and that’s been after sales of the cars have been banned in a couple of states. Maybe if Porsche had succeeded back in ‘84, things would be different.